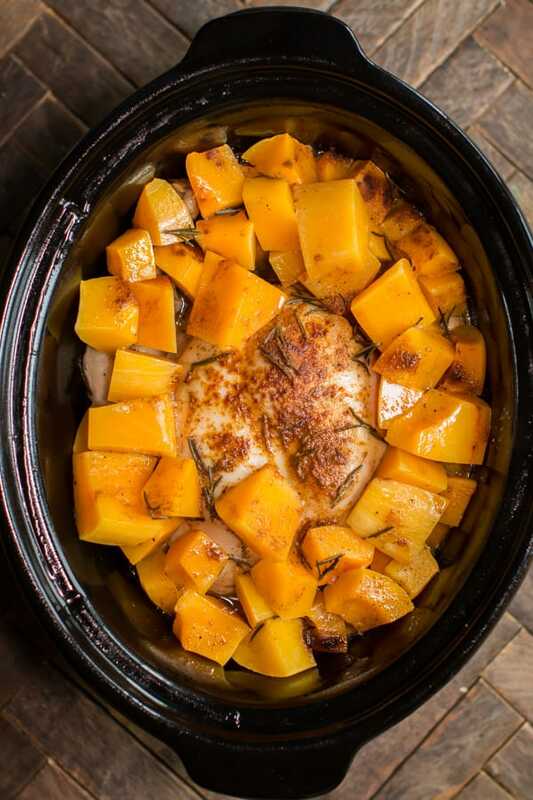 This Slow Cooker Rosemary Chicken and Butternut Squash is a one pot meal with great flavor! It still feels like winter here in Oregon! Never ending cold and rain, I think this is the longest winter I’ve experienced here. This meal was nice to come home to after a long day running errands, especially nice since it’s a one pot meal! 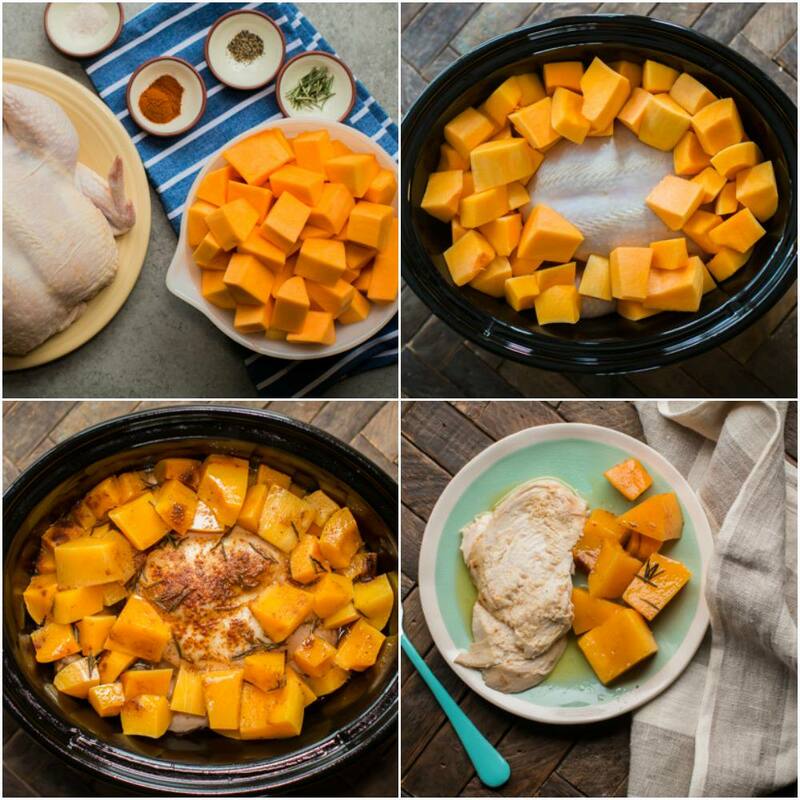 The chicken is very tender and moist and so is the butternut squash. 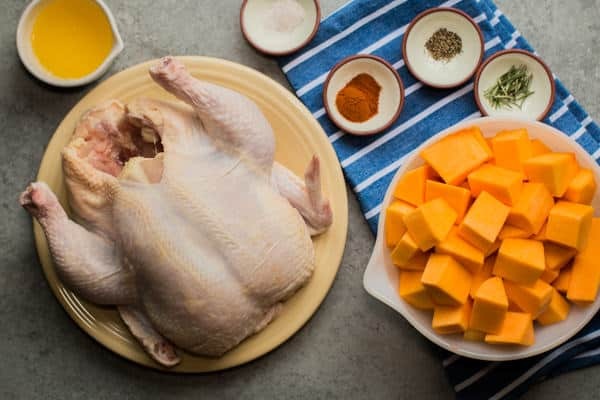 You can see in my recipe below that I cook the chicken and butternut squash for 8 hours together. My first test run of this meal I put the butternut squash in at the half way point, doing that the butternut squash did not get buttery tender like butternut squash should be. I’m glad I retested this meal, it’s a great recipe that can go a full 8 hours, which is nice when I’m away all day. Below is the chicken after cooking 8 hours on low. Look at that glistening butternut squash! See below my video how to make this meal. You can follow me on YouTube here. After removing the chicken from it's packaging and be sure to remove any extras from both sides of the cavity and discard. Pat dry. 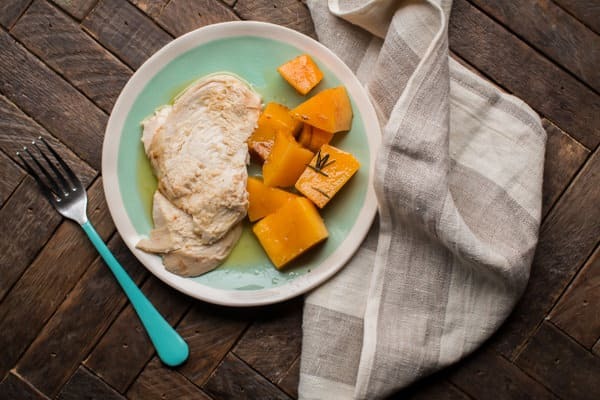 Add the butternut squash around the chicken. 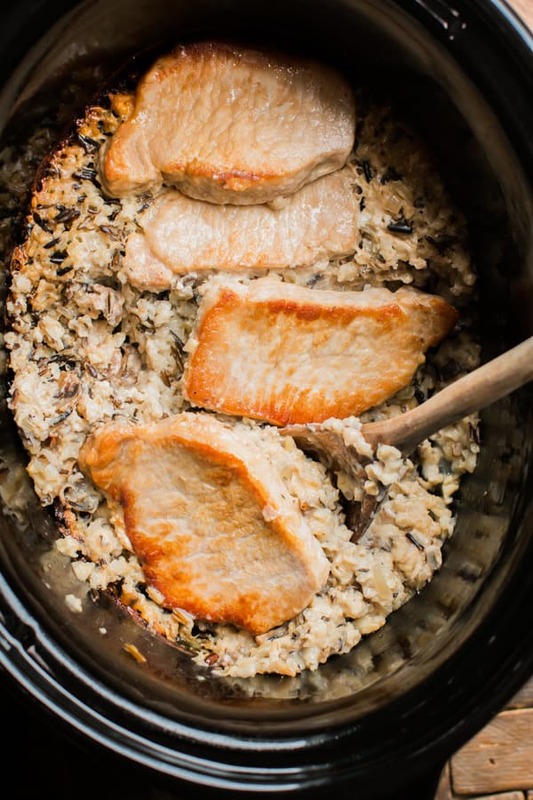 I used my 6.5 quart touchscreen Crock-Pot® for this recipe, though any 6-quart or larger will work fine. 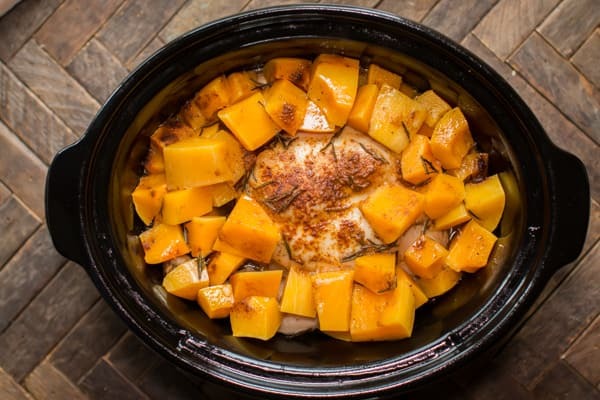 Can the SLOW COOKER ROSEMARY CHICKEN AND BUTTERNUT SQUASH be done in half with thighs or breasts pieces and potatoes instead of the squash? I am one and six servings is too many and squash is really not a favorite. Hi Coren! I think it would be worth testing out! You may have a new favorite recipe. How much butternut squash?? Your recipe says one, but one can be big or small. About how much cup wise would help. Thanks! My butternut squash was pretty large. I would say about 5-6 cups. If I were to use boneless skinless chicken breasts (probably 4) instead of a whole chicken, how should I modify the cooking time? Thanks! I think it would need about the same cooking time. 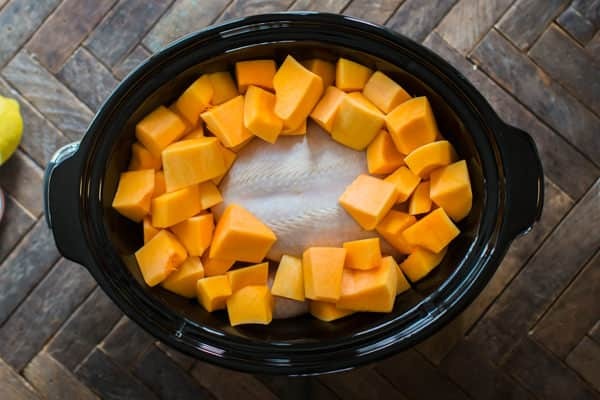 The butternut squash takes a while to get tender. I think thyme would work great! Looks great. My husband is going to have to start eating a diet because of high cholesterol. He’s a thin man. GO FIGURE. Would this work for him? I know it has butter but once divided into servings it shouldn’t hurt. Right?